Description: The Action Garage completed the Little People trilogy. The trilogy also included the #952 House and #915 Farm. The garage, house, and farm sets have proved perennial favorites after 30 years. 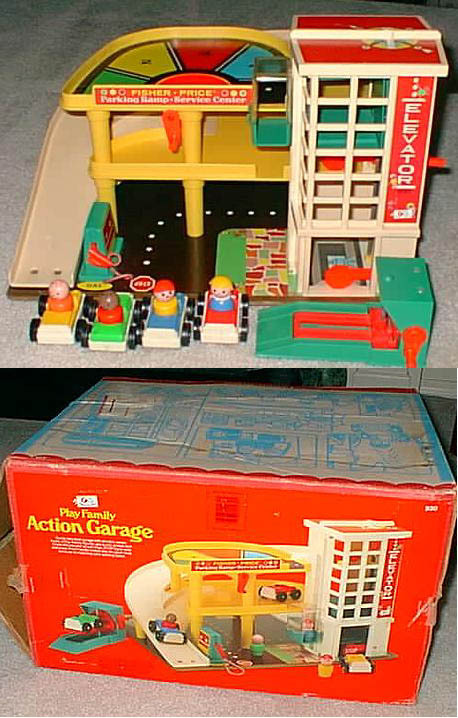 The long-running popularity of the garage was more impressive considering how few accessories it had--only nine, the least pieces included in any large base-oriented playset. After 15 years with few alterations, #930 became a redesigned #2504 Play Family Garage and went through several identity crises for the next five years. The base itself is a 3-story parking garage with a masonite base, a white ramp, and a 3-story elevator. The elevator is operated by a crank on the side and a bell rings as the elevator moves moves up and down. 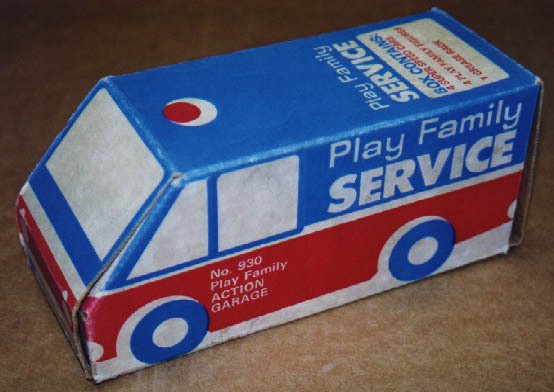 When the Garage set was first introduced, it was sold with a cardboard service van to store the accessories into. The van was designed to be like the storage silo used on the #915 Farm, but the cardboard box is nowhere near as sturdy, therefore, discontinued shortly after it was introduced. There is another small rectangular box that was sold with this set...plain cardboard with red print on the sides. Fisher-Price may had replaced the cardboard service van with the smaller cardboard box for a short time. Neither the van nor the small box were ever pictured nor mentioned in the dealer catalogues, but both are quite rare and by far the hardest pieces in this set to find. B930A - Garage Base - Garage with a masonite base, a white 3-story elevator shaft, and a white plastic ramp on the back and side. This base DOES have the white-painted arrows on the red upper deck spinner and the white-painted word "STOP" on the stop signs. FPT1018 - Green (dark green) service garage lift with a red crank and red drive-on car ramp. As the crank is turned, the lift moves up and down with a ratcheting sound. The back of the lift has a red litho marked with a Fisher-Price logo, "930", a yellow mop bucket, and a light blue servicing machine. FPT885 - Green top, white base garage style car. This car is marked "fp" and "Fisher-Price Toys" on the HOOD, it has a gas hole on the back corner, and it rolls on black 7/8" dia. wheels that are marked "Fisher-Price Toys". The wheels are held on via metal axles. No C-hook on back of car. *See "Variations" below. FPT887 - Red top, white base garage style car. This car is marked "fp" and "Fisher-Price Toys" on the HOOD, it has a gas hole on the back corner, and it rolls on black 7/8" dia. wheels that are marked "Fisher-Price Toys". The wheels are held on via metal axles. No C-hook on back of car. *See "Variations" below. FPT889 - Yellow top, white base garage style car. This car is marked "fp" and "Fisher-Price Toys" on the HOOD, it has a gas hole on the back corner, and it rolls on black 7/8" dia. wheels that are marked "Fisher-Price Toys". The wheels are held on via metal axles. No C-hook on back of car. *See "Variations" below. ETWW - Yellow boy smiling with a red baseball cap facing forward. FPT891 - White top, blue base garage style car. This car is marked "fp" and "Fisher-Price Toys" on the HOOD, it has a gas hole on the back corner, and it rolls on black 7/8" dia. wheels that are marked "Fisher-Price Toys". The wheels are held on via metal axles. No C-hook on back of car. *See "Variations" below. FPT893 - White top, green base garage style car. This car is marked "fp" and "Fisher-Price Toys" on the HOOD, it has a gas hole on the back corner, and it rolls on black 7/8" dia. wheels that are marked "Fisher-Price Toys". The wheels are held on via metal axles. No C-hook on back of car. *See "Variations" below. FPT897 - White top, yellow base garage style car. This car is marked "fp" and "Fisher-Price Toys" on the HOOD, it has a gas hole on the back corner, and it rolls on black 7/8" dia. wheels that are marked "Fisher-Price Toys". The wheels are held on via metal axles. No C-hook on back of car. *See "Variations" below. ERWW - Yellow boy frowning with freckles and a red baseball cap facing forward. DLWW - Red African-American boy with black heat-stamped hair and a raised "belt" rim around his waist. ERWW or ERWP - Yellow boy frowning with freckles and a red baseball cap facing forward. BNWP - Green boy with red heat-stamped hair. ITWP - Red African-American boy with black heat-stamped hair. ERWP or ERPP - Yellow boy frowning with freckles and a red baseball cap facing forward. BNWP or BNPP - Green boy with red heat-stamped hair. ITWP or ITPP - Red African-American boy with black heat-stamped hair. ERPP - Yellow boy frowning with freckles and a red baseball cap facing forward. ITPP - Red African-American boy with black heat-stamped hair. FPT884 - Blue top, white base garage style car. This car is marked "fp" and "Fisher-Price Toys" on the HOOD, it has a gas hole on the back corner, and it rolls on black 7/8" dia. wheels. The wheels are NOT marked "Fisher-Price Toys" and they are held on via metal axles. No C-hook on back of car. *See "Variations" below. FPT886 - Green top, white base garage style car. This car is marked "fp" and "Fisher-Price Toys" on the HOOD, it has a gas hole on the back corner, and it rolls on black 7/8" dia. wheels. The wheels are NOT marked "Fisher-Price Toys" and they are held on via metal axles. No C-hook on back of car. *See "Variations" below. FPT888 - Red top, white base garage style car. This car is marked "fp" and "Fisher-Price Toys" on the HOOD, it has a gas hole on the back corner, and it rolls on black 7/8" dia. wheels. The wheels are NOT marked "Fisher-Price Toys" and they are held on via metal axles. No C-hook on back of car. *See "Variations" below. 2 each - ERPP - Yellow boy frowning with freckles and a red baseball cap facing forward. B930B - Garage Base - Garage with a masonite base, a white 3-story elevator shaft, and a white plastic ramp on the back and side. This base DOES NOT have white-painted arrows on the red upper deck spinner nor white-painted word "STOP" on the stop signs. 1970-1984 - B930A - Garage Base - Garage with a masonite base, a white 3-story elevator shaft, and a white plastic ramp on the back and side. This base DOES have the white-painted arrows on the red upper deck spinner and the white-painted word "STOP" on the stop signs. 1985 - B930B - Garage Base - Garage with a masonite base, a white 3-story elevator shaft, and a white plastic ramp on the back and side. This base DOES NOT have white-painted arrows on the red upper deck spinner nor white-painted word "STOP" on the stop signs. 1985 - B930C - The 1985 garage base was also available without the white-painted arrows on the upper deck spinner, but with the white-painted word "STOP" on the stop signs. JMPP - The red African-American boy could also have a light or coral red body opposed to a medium red body. FPT883 - Blue top, white base garage style car. This car is marked "fp" and "Fisher-Price Toys" on the HOOD, it has a gas hole on the back corner, and it rolls on black 7/8" dia. wheels that are marked "Fisher-Price Toys". The wheels are held on via metal axles. No C-hook on back of car. FPT885 - Green top, white base garage style car. This car is marked "fp" and "Fisher-Price Toys" on the HOOD, it has a gas hole on the back corner, and it rolls on black 7/8" dia. wheels that are marked "Fisher-Price Toys". The wheels are held on via metal axles. No C-hook on back of car. FPT891 - White top, blue base garage style car. This car is marked "fp" and "Fisher-Price Toys" on the HOOD, it has a gas hole on the back corner, and it rolls on black 7/8" dia. wheels that are marked "Fisher-Price Toys". The wheels are held on via metal axles. No C-hook on back of car. FPT893 - White top, green base garage style car. This car is marked "fp" and "Fisher-Price Toys" on the HOOD, it has a gas hole on the back corner, and it rolls on black 7/8" dia. wheels that are marked "Fisher-Price Toys". The wheels are held on via metal axles. No C-hook on back of car. FPT895 - White top, red base garage style car. This car is marked "fp" and "Fisher-Price Toys" on the HOOD, it has a gas hole on the back corner, and it rolls on black 7/8" dia. wheels that are marked "Fisher-Price Toys". The wheels are held on via metal axles. No C-hook on back of car. FPT897 - White top, yellow base garage style car. This car is marked "fp" and "Fisher-Price Toys" on the HOOD, it has a gas hole on the back corner, and it rolls on black 7/8" dia. wheels that are marked "Fisher-Price Toys". The wheels are held on via metal axles. No C-hook on back of car. FPT889 - Yellow top, white base garage style car. This car is marked "fp" and "Fisher-Price Toys" on the HOOD, it has a gas hole on the back corner, and it rolls on black 7/8" dia. wheels that are marked "Fisher-Price Toys". The wheels are held on via metal axles. No C-hook on back of car. Sometime during it's production, this set was sold with a small rectangular cardboard box with red print on the side. The words prints are on side are "#930 Fisher-Price Play Family Action Garage Play Parts Enclosed". This is not the same cardboard box "moving van" that is mentioned above. 1970-1981 - This set was sold in a 17-1/2" long, 11" high, 15-1/2" deep box. 1982-1983 - This set was sold in a 19-3/8" long, 16" high, 11-3/8" deep box. 1984 - This set was sold in a 18-7/8" long, 15-3/4" high, 11-1/8" deep box. 1985 - This set was sold in a 19" long, 15-7/8" high, 11-1/4" deep box. This set may also be called Parking Ramp - Service Center (this is what litho on front says). 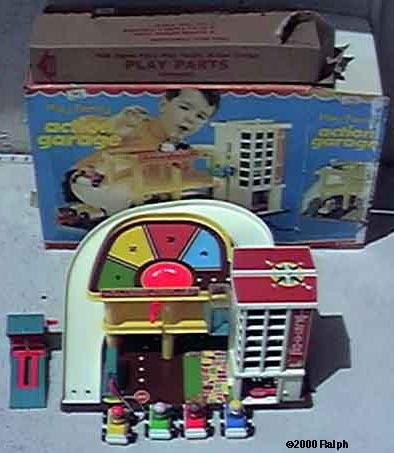 The Little People Garage set was reissued in 1986 as #2504 Play Family Garage.